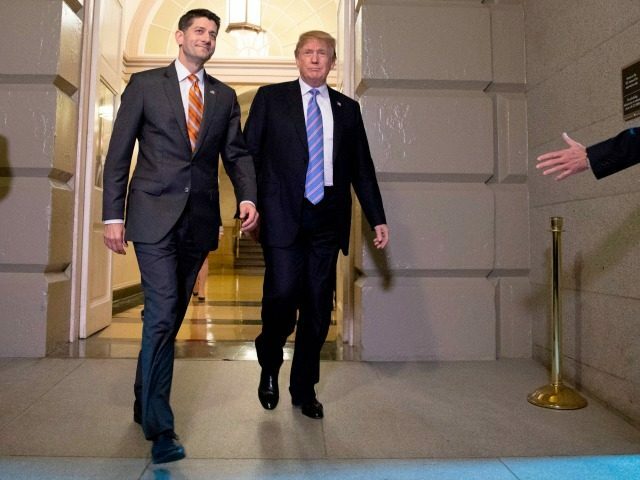 President Donald Trump deflated House Speaker Paul Ryan’s amnesty push Thursday night with a Tweet saying that Democrats will block any amnesty deal. Trump’s Tweet torpedoed late-afternoon hopes among Republicans that personal calls from Trump could deliver another 30 votes from wavering or hostile GOP legislators for Ryan’s bill. The head of the Republican Study Committee, Rep. Mark Walker, urged the president to make those calls.
.@RepMarkWalker says that House members needs the president's vocal support of the compromise bill. "What would compliment the most to that is having the president continue to add to his voice to this compromise bill"
Trump’s Tweet is correct about the Senate Democrats’ opposition to a deal, said Jessica Vaughan, policy director at the Center for Immigration Studies. But the underlying message in Trump’s Tweet is a soft goodbye to Ryan, Vaughan said. Like in a slow breakup, the message is “I’m just not that into you, I’ve changed, we’ve changed,” she said. “This is not exactly what Paul Ryan would ask him to do” to help his amnesty bill get passed, she said. Trump’s tweet also came after GOP leaders announced the vote on the bill would be postponed first to Friday, then to next week, and that the bill would be sweetened with an E-Verify mandate sought by populists, plus a huge program to import low-wage workers for low-tech farms. That low-wage “H-2C” program is pushed by most of the farm-district legislators who pushed the discharge petition. The cheap-labor legislators are almost universally deemed to be “moderates” by the establishment media. The bill’s outlook is poor, leaving Vaughan to consider the political accomplishments from the long fight, including the 193 votes cast for Judiciary Chairman Bob Goodlatte’s reform bill. The fight “provides a talking point for everyone,” including Trump, she said. GOP legislators can pull multiple campaign messages from the dispute, she said. Some can tell liberals they would have voted for Ryan’s amnesty, while others get to say they voted for Goodlatte’s border reforms and Trump’s wall, she said. Democrats can tell their left-wing voters that “‘I refused to vote for the extreme Republican bill, the heartless Republican bill that denied the dreamers citizenship and funded that silly wall and wanted to separate families,'” she said. For activists and journalists, the lesson learned is the growing strength of populist views among legislators, she said. Goodlatte’s bill got 193 votes, and without any leadership whipping or a determined Presidential intervention. “All during the [2013-2014] Gang of Eight episode, the people who voice the conventional wisdom were saying it was only a rogue group of 35 people like [Rep.] Steve King and [Rep.] Louie Gohmert, and this shows, this [reform] is the mainstream Republican position,” said Vaughan. Basically, Republicans were 20 votes short of passing a hardline immigration bill that members were told was unpassable. 193 votes, when you only needed 213 today, doesn’t seem unpassable to me. Goodlatte got 193 votes for his bill despite opposition from the GOP’s usual donors, all of whom denounced Goodlatte’s planned cuts to legal immigration. Currently, four million Americans turn 18 each year and begin looking for good jobs in the free market — but the government provides green cards to roughly 1 million legal immigrants and temporary work-permits to roughly 3 million foreign workers.